Looking for a few Buffett stocks to supplement your income? Here's why you should check out Phillips 66, Coca-Cola, and Kraft Heinz Company. One way to increase your odds of picking winning stocks is to copy ideas from the masters. That's why we Fools regularly pore over SEC filings to see which stocks famous investors such as Warren Buffett currently own. After all, if an investing legend like Buffett has committed billions of dollars in capital to a company, there's probably a good reason. Which Buffett stocks do we think are good choices for a retiree? We asked a team of investors to answer that question, and they picked Phillips 66 (NYSE:PSX), Coca-Cola (NYSE:KO), and Kraft Heinz Company (NASDAQ:KHC). Reuben Gregg Brewer (Phillips 66): Buffett used to own ExxonMobil (NYSE:XOM), an integrated oil giant with operations spanning the energy industry. He made big news when he sold Exxon and instead bought Phillips 66, which is focused on the midstream, refining, and chemicals side of the oil business. These are businesses with pretty wide moats, as Buffett likes to call durable competitive advantages. Essentially, the assets that Phillips 66 owns and operates would be difficult at best to replicate or replace. Oil is interchangeable; a pipeline is not. The company also has an interesting business mix. Its fee-based operations (i.e., pipelines) are a solid foundation that benefits from demand with less impact from energy prices. Meanwhile, results in the chemical and refining businesses will tend to fluctuate with the price of oil because it's a spread business. Taken together, however, there's a fair amount of consistency in Phillips 66's results. For example, it has increased its dividend every year since it became a standalone company in 2012, taking the dividend from $0.20 per share each quarter to $0.70 in roughly five years. The current yield is about 3.4%. 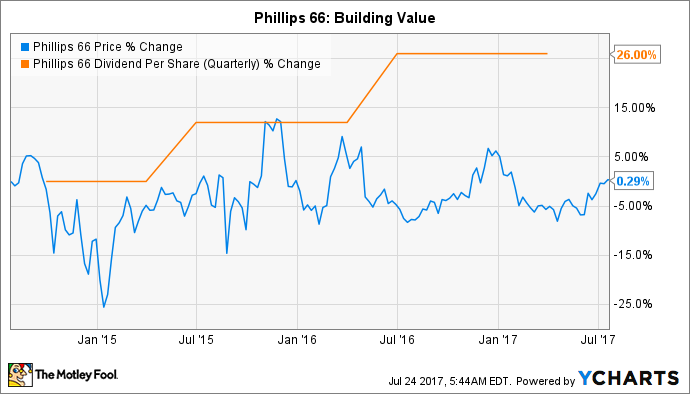 Phillips 66 is well positioned financially as well, with debt making up just 30% of the capital structure. That means it should have little trouble paying for its growth plans, which includes spending around $1.7 billion on expansion projects in 2017. The stock, however, has basically gone nowhere for three years despite a 26% increase in the dividend over that span and growth spending that has been brought more in line with Phillips 66's cash-generating ability. It could be a good time to jump on this Buffett stock if you're a long-term investor looking for dividend income. Keith Noonan (Coca-Cola): With soda sales under pressure as a result of consumers who are opting for healthier options, Coca-Cola probably isn't the company to hitch your wagon to if you're looking for big growth. But it still stands as a great stock for retirement-focused portfolios. Stocks that pay substantial dividends provide valuable supplemental income for your non-working years, and when it comes to reliable dividend increases, few companies have a better track record than Coke. The stock currently packs a 3.2% dividend yield, and given the company's 55-year history of annual payout increases, there's a great chance that shares purchased today will post even bigger yields in the years to come. While Coke has lagged the S&P 500 over the past five years, stocks that pay substantial dividends have tended to outperform the market over the long term. That's partially because income generation puts a floor on share prices and presents a nearly guaranteed return, but it's also because companies that are in a position to reliably pay dividends tend to have sustainable competitive advantages. Loading up on these types of investments has fueled Buffett's incredible market-beating performance over the years, and Coke remains one of Berkshire Hathaway's largest holdings. The beverage giant's moat comes from its scale and infrastructure advantages and its stable of powerful brands -- with 21 products that generated at least $1 billion in retail sales last year. The beverage leader boasts a nearly unrivaled distribution network, and brand strength should help it retain pricing power even amid a slowdown in domestic soda sales. With one of the best dividend profiles of any company on the market, backed by a historically resilient business, Coke continues to be a strong stock for retirement. Brian Feroldi (Kraft Heinz Company): What do Oscar Mayer, Maxwell House, Lunchables, and Velveeta all have in common? Aside from being household names that rack up more than $1 billion in annual sales, all of these food brands -- and dozens more -- are owned by Kraft Heinz Company. Buffett has been a fan of investing in companies with strong brand names for decades. That's why his portfolio is full of companies such as Apple, American Express, and IBM, to name a few. So pnlargest publicly traded holding. Berkshire owns nearly 27% of the company, which at current prices is worth more than $28 billion. A quick glance at Kraft's financial statements makes it obvious why Buffett holds Kraft Heinz in such high esteem. The company's broad portfolio of brands generated more than $26 billion in total sales last year and cranked out more than $3.4 billion in net income. That translated into $2.84 in EPS, the majority of which was passed along to shareholders in the form of a juicy dividend payment. Looking ahead, the company has a multi-year initiative in place to keep its bottom line heading in the right direction. By year's end, the company expects to have delivered $1.7 billion in cumulative pre-tax savings since its megamerger was completed. Those savings should easily translate into net income gains. In turn, investors should expect the dividend to continue to grow for the foreseeable future. While Kraft Heinz's huge size will prevent it from putting up eye-popping growth numbers, investors can rest easy knowing they own part of a rock-solid and largely recession-proof business. With shares currently yielding 2.7%, this Buffett stock is a great pick for income-focused investors.